Index funds are a lazy investor’s best investment choice. You can invest your money in them, and even if you never research a single stock or try to time even one market turn, you will never, ever under-perform the overall stock market. This makes index funds the logical choice for most investors. It’s not that most investors are lazy, but more that most of us are not professional investors, and not familiar with what is necessary in order to successfully invest in stocks. When you invest in index funds, you simply don’t need to. 1. Try as you may, you probably can’t beat the market. The only logical reason to directly manage your own stock market investments is the hope of beating the market. However, it’s unlikely that you’ll be able to accomplish that, at least not on a long-term, consistent basis. In reality, only about 24% of active fund managers outperform the market over a ten-year period. And those are people who invest in stocks for a living, and on a full-time basis. If most of them can’t beat the market, what chance do you and I have? By default, if you invest your money in index funds, you will outperform the investment results of 76% of actively managed mutual funds. That’s not a bad deal at all! 2. Index funds are tax-advantaged investments. One of the little understood benefits of investing in index funds is that they are tax-advantaged investments. That’s nothing like being tax-deferred or tax-free, but what it means is that the investment methodology used results in lower tax liabilities. This comes about because index fund portfolios are correlated to the composition of the underlying market index. The funds trade stocks within the portfolio only as is necessary to keep it properly aligned with the index. Since most stock indices are relatively stable, that means that index funds don’t trade stocks very often. That absence of trading means fewer capital gains situations that need to be reported on your income tax return. And when there are capital gains, they are the long-term variety, and subject to lower long-term capital gains tax rates. Since actively managed funds openly attempt to outperform the market, they tend to trade much more frequently, creating more capital gains and more capital gains tax liabilities. And often those capital gains are short-term, which means they are subject to ordinary income tax rates. An index fund can grow for decades, while incurring very little income tax liability in any single year. That’s not quite the same as being tax-deferred, but it’s the closest you can get to it. 3. Index funds are one of the lowest cost ways to invest in stocks. Once again, low turnover within the stock portfolio works in your favor. Because there is very little trading with an index fund, there are also far fewer transaction fees. That translates into higher annual returns. 4. You have better things to do with your time. One of the very best advantages to index funds actually has nothing to do with investing. Index funds are probably the most passive type of stock market investing available. Your money can be fully invested in stocks, but you don’t need to worry about trading, picking stocks, or even monitoring the performance of the fund. It’s fire-and-forget investing at its finest. You probably have a career, a business, a budget, and a life to lead, and you’ll be able to do all of those much better and more efficiently if you don’t need to worry about your investment portfolio. Index funds can make that happen. You buy into them, set up an automatic investment plan, then go about the rest of your life. 5. Index funds are the ultimate buy-and-hold investment. It is precisely because index funds are virtually passive that they are the ultimate buy-and-hold investment, at least as far as equity investments are concerned. When you invest in index funds, you can literally plan on holding them for decades. There is nothing you need to do in-between except sit back, relax, and wait for your investment portfolio to grow. Alternatively, index funds can also be a great in-and-out vehicle too, although that is not the primary purpose. Since their performance mirrors the general market, you can use them to buy in after a major decline in the market, and then sell out if you think the market is getting a little bit rich. The advantage they have in this regard is that you don’t have to concern yourself with picking individual stocks, you’re buying into a portfolio that represents the overall market, and will rise as the tide lifts all boats. 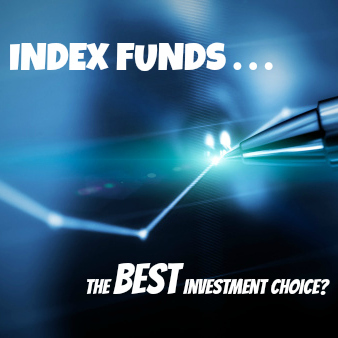 Do you agree that index funds are the best investment choice for most investors? Leave a comment!